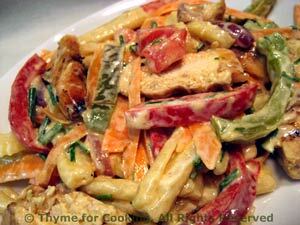 Pasta with Grilled Chicken and Peppers, Thyme for Cooking gourmet menus. I tend to use yogurt for creamy dressings rather than mayonnaise: it's lower in calories, has the benefit of adding calcium to the diet and doesn't have all the additives of commercial mayonnaise. But, I discovered that adding a little mayo to the yogurt can change the whole flavor of the dressing to be more like the mayo-based dressing. Another example of a little going a long way..